Mark Hamill and Carrie Fisher on stage during Future Directors Panel at the Star Wars Celebration 2016 at ExCel on July 17, 2016 in London, England. 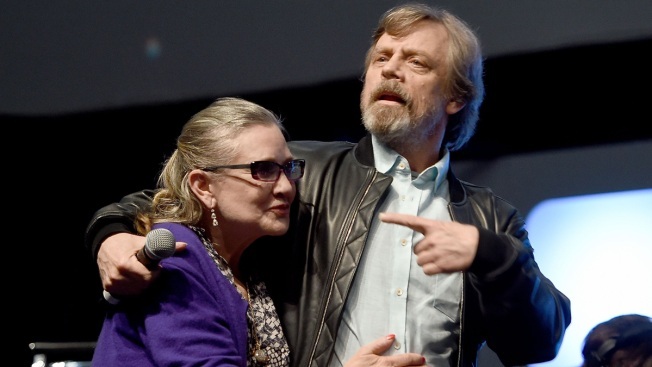 Mark Hamill says he's still grieving over Carrie Fisher's death, but sharing memories of his late friend and co-star with fans at Star Wars Celebration is "part of the process that I need to move on." Hamill led an hourlong tribute to Fisher on Friday evening at the event in Orlando, Florida. "I'm trying to use you as therapy to get through this together," the actor said. He called Fisher "my beloved space twin" and said they were also great friends off-screen. They even shared a steamy make-out session once, he said. "Tonight Show" host Jimmy Fallon and The Roots join Daisy Ridley, John Boyega, Oscar Isaac, Adam Driver, Gwendoline Christie, Lupita Nyong'o, Carrie Fisher and Harrison Ford for an a cappella tribute to "Star Wars." "As attracted as I was to her, I thought I couldn't handle her as a girlfriend. She's too much," Hamill said. "Part of me did fall in love with her. I think every guy... She had you under her spell." Hamill told stories of visiting with Fisher and her mother, Debbie Reynolds, in New York and attending incredible parties at their homes in Los Angeles. He also introduced video clips of George Lucas and "The Last Jedi" director Rian Johnson in which they share anecdotes about working with Fisher. "Wait until you see her in 'The Last Jedi,' " Hamill added. "You're going to love her." His voice cracked as he read a letter he had written shortly after Fisher died in December. He spoke of how he admired her intellect, attitude and sense of humor. Hamill said his personal and professional life would have been diminished had she not been part of them. He said that while he's still in mourning, he's focusing on her legacy. "When I think of her, she's looking down from the celestial stratosphere with those big brown eyes, that sly smile on her face, as she lovingly extends me the middle finger," Hamill said. "And that's how I want you to think of her. That was Carrie."